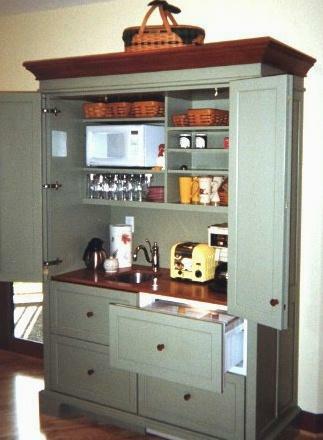 This new kitchen in Oregon is completely furnished with several YesterTec workstations, including two pieces in the breakfast room, both painted in Faded Green with Natural Cherry accents. The piece on the left is a cupboard (PS40 / B40-T) and the piece on the right is a hospitality center (SZ5-WP-54) that conceals a Subzero 700 base refrigerator. The bi-fold doors conceal a full countertop, a sink, a small microwave, a toaster and lots of shelf/storage space. 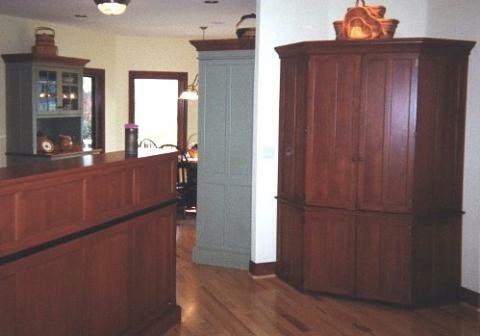 The breakfast room pieces are to the left rear of this picture that includes an unfitted S84A sink island and an CD34 Corner Armoire/Desk. This is the view from the Living area of this open plan home.